Lights will guide you home and ignite your bones. And I will try to fix you. Rather than a nose with a dog attached, the beagle is best described as a heart with a dog attached - a fact that drew B.O.B's founder, Marna Gale, to this silly but undeniably addictive breed over 10 years ago when she fostered and adopted her first beagle, Darwin. While one must admit the beagle will follow its nose at any opportunity, it is also certain that he will follow his heart. The beagle is sensitive, loving and inexplicably happy-go-lucky. Such glowing characteristics make it easier to overlook the high food drive and endless passion for the common garbage can --- at least for fellow beagle enthusiasts. Sadly, misunderstood beagles wind up in animal shelters at a constant rate. But beagle lovers are everywhere as so many find it hard to resist their adorably angelic faces. Healthy young beagles are little to no trouble for animal shelters to place into loving homes. If the novice beagle owner educates themself in advance and trains their new companion using positive reinforcement, that beagle will (paws crossed!) enjoy a wonderful life in their FURever home! B.O.B is there to help the not so fortunate, i.e. 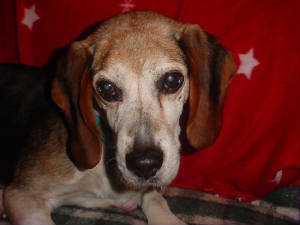 special needs beagles like older beagles - some with health issues and even some terminally ill, overweight beagles, beagles lacking in confidence with an assortment of emotional baggage in tow, the list goes on. In a nutshell, B.O.B lends a paw to those needing a second chance. Beagles entering B.O.B's program are usually coming from animal shelters that have not been successful in matching them with families. The kind staff working at these facilities will call B.O.B for assistance. Giving up on an unwanted beagle is not an option for these caretakers and B.O.B is always grateful for their phone calls. Sometimes, it's quiet on the rescue front and B.O.B can focus on the rehabilitation and later placement of 2 or 3 beagles. Other times, the calls are pouring in and there are not enough B.O.B foster parents available. That's why B.O.B is always sniffing out reliable, dedicated beagle lovers who are willing to open their doors and their hearts to a down-on-his-luck beagle until a permanent home can be found. Fostering is not easy, mind you, but your efforts are rewarded tenfold when that beagle finds the perfect family - all because of YOU!!! [To learn more about fostering, contact the B.O.B hotline at 905-623-1044!] If you are looking to adopt a beagle, all beagles currently available through B.O.B are featured here (We are currently not on Petfinder). But don't despair if there are no beagles to view! B.O.B is often aware of other beagles looking for good homes, so don't hesitate to leave a message! On the other paw, if you own a beagle and can no longer care for him, you are also welcome to contact B.O.B. We understand that unforeseen circumstances can lead to such a heartbreaking decision. B.O.B will lend support and good advice on how to find a new home for your companion. In fact, B.O.B may have a prospective owner looking for a beagle right now and your dog may be the perfect match! The work B.O.B performs for the love of beagles is not without sacrifice and an unwavering commitment to the cause. Veterinary care for B.O.B's beagles is expensive, but B.O.B makes a promise to every dog that enters the program, ensuring the dogs get all they need right from the start. If B.O.B is instrumental in placing your beagle or in finding you the beagle of your dreams outside of its own adoption program, please consider making a donation to B.O.B so that more beagles may benefit from its rescue services. Your support, no matter the size, means so very much and without a doubt helps make fairytale endings come true for all our little howlers. Please contact the B.O.B hotline to learn how to make your gift and touch the life of a beagle in need. On behalf of the beagles, thank you for visiting our website. Or, call the BOB Hotline: 905-623-1044 *New Number as of Spring 2017! *If calling, please call between the hours of 10:00am - 8:00pm as it is also our residential number - THANK YOU!